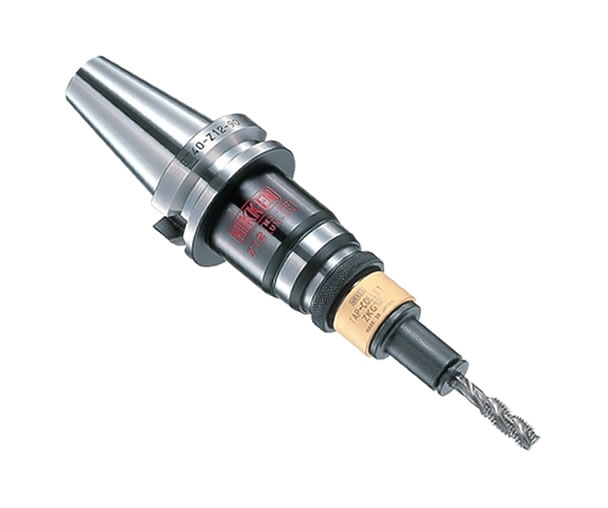 Nikken provide numerous solutions to meet the requirements of tapping applications. For machine tools enabled with rigid tapping capabilities our standard Multi-Lock and Slim Chuck ranges offer a more than adequate tapping solution. For a more specific tapping solution we have developed and offer a complete range of tapping chucks and collets. Within the range we feature synchronised, floating, auto depth control and auto reversing variants. All systems utilise our precision collets adaptors with the in-built rotary bearing cam system. This system features an internal roller cam which acts sensitively and smoothly against any tapping torque vibration. Nikken tap collets also feature a design that optimises the torque life curve. This principle is fundamentally different to conventional systems featuring a rubber reaction or friction resistance. The system allows users to obtain safe and secure tapping torque consistently. For the floating tapping chuck the external dimensions are reduced to their minimum without any loss in performance. Internally the system includes not only a simply slide key to maintain the load but an exclusive plural pre-loaded ball bearing key system arranged in a 'V' formation. This maintains the smooth movement of the tap during retraction and ensures chattering does not accompany the cycle.